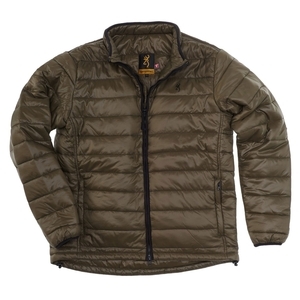 Browning Featherlight Primaloft Bodywarmer Jacket. Made with an ultralight Ripstop fabric and featuring 120g Primaloft insulation, this lightweight, breathable and water repellent jacket is perfect for wet weather game hunting. PrimaLoft™ is a premium performance insulation engineered for superior warmth, water resistance, loft, softness and compressibility. These fibers are the finest in the industry and are densely packed to retain heat better for improved thermal efficiency. PrimaLoft™ fibers are specially treated to repel water molecules and absorb less water to make it more water-resistant and faster drying than other polyester insulations. Tightly-compressed fibers also make PrimaLoft™ highly wind-resistant as the smaller, finer fibers compress more and are lighter, less bulky, more breathable and extremely compressible. That’s what makes our clothing with PrimaLoft™ insulation so good.